» How about snow removal? Snow is left on Albany streets until it turns to slush and melts. 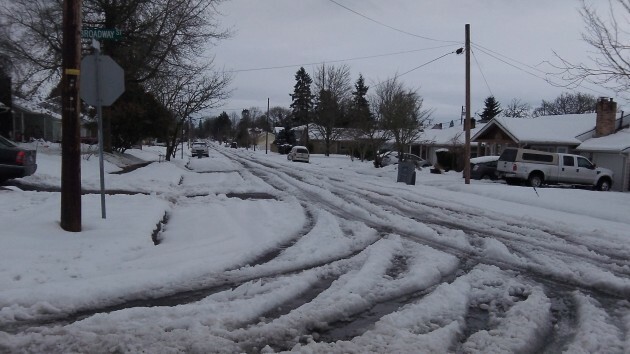 Now that Oregon’s Mid-Willamette Valley is wallowing in slush, municipal authorities might give some thought to the next winter storm that brings us more than a foot of snow and then covers it with a quarter-inch of ice. We can be sure that it will happen again, maybe sooner than we think. Prepared for snow we are not. Albany, for example, has no snow plow, which was obvious in the aftermath of the storm from Feb. 6 through 9. The city has explained that plowing would not be possible anyway because parked cars line both sides of most streets. Right, plowing is for highways and the major county roads, where the snow scooped up by the blade can be thrown into or beyond the roadside ditch. But what about snow “removal”? Would that be a possibility, at least on arterial roads? This would be worth for mid-valley towns to look into, considering that we may be heading into one of those multi-year Pacific weather swings where colder and snowier winters again become the norm. Meteorologist Steve Pierce, owner of Northwest Weather Consultants in Vancouver, Wash., says the recent storm fit into a pattern: Cold air from up north and moisture from the Pacific come together over Portland and the Willamette Valley about every five years or so. “The winters of 1998/99, 2003/04, 2008/09 and 2013/14 all saw significant arctic outbreaks and/or snow at low elevations,” Pierce writes. Infrequent snow and the unpredictability of accumulations isn’t something handled well in Willamette Valley cities. A couple of options that make more sense would be to contract with local landscapers & contractors on a contingency basis. Local businesses with equipment can represent greater capacity and re-bid every couple years. If they do a poor job, nothing requires a contract be inked again. Set aside a fixed fund amount each year in a snow contingency fund and pay out only as needed. Only spend the money on the service as needed. If it’s going to melt in 24 hours, let Mother Nature do the job. It makes little sense for the City to have equipment parked for years at a time to be deployed a half dozen days every 4-6 years. Things would go much better if the City/Citizens cleared the drains along the curb. Puddles and slush are the result of blocked drains. @shoveledmine, you say it makes little sense for the city to have equipment parked for years, …. No argument there. But, earlier you suggest contracting with local landscapers and contractors as needed for snow work. If it is not a good idea for the City to have equipment unused for years, why would a for-profit entity think it a good idea to have equipment unsued for years? In other words, why would a landscaper invest in equipment used rarely, such as plows for trucks, along with trucks equipped to handle plows, that is rarely used? Your idea sounds fine, but, in reality, no smart business entity will make such an investment. ROI is critical, and equippment sitting idle for long periods will not produce a return. It would be nice if the city at least cleared the parking lots of high-use city facilities, e.g. the library. Safeway cleared their lot for employees and customers, why didn’t the city? The City of Albany maintains more than 350 lane miles of city streets; one mile of street with curbs and gutters on both sides equals two lane miles. For many years, we have maintained a list of contractors upon whom we can call to do snow plowing when conditions call for it. The Oregon Department of Transportation plowed the state highways through Albany on Sunday in preparation for this morning’s commute. Our Street Maintenance crews were on duty around the clock from Thursday through today, sanding at major intersections, which helped break up packed snow and keep major travel routes passable through the weekend. We did contract plowing this morning on parking lots at City Hall and other City buildings that were closed over the weekend, including the Main Library, which closed late Thursday, remained closed through the weekend, and reopened at 10 a.m. today.